The Lower Modernisms – 015. 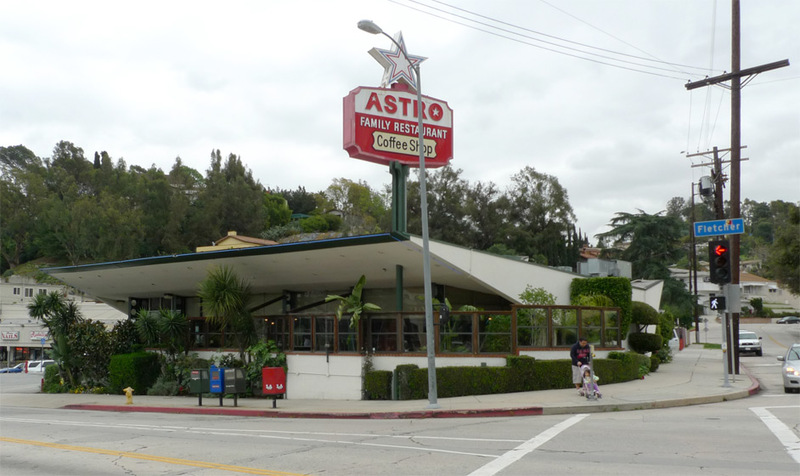 Lomo Featured Project: Astro Family Restaurant formerly known as “Donly’s” and “Conrad’s”. 2011 Googie Coffee Shops Bicycle Ride Series, March Ride. April 13, 2011 by James Black. 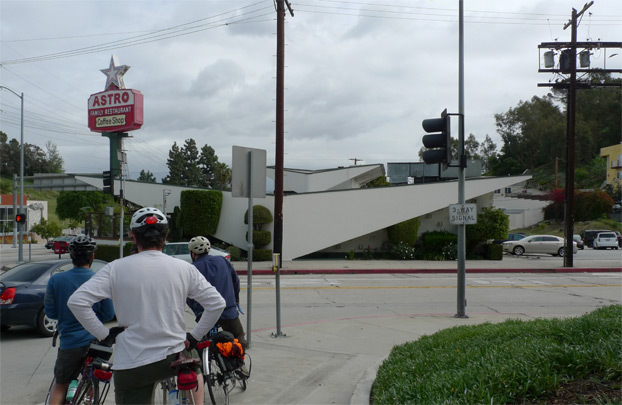 On March 26, seven enthusiasts participated in the third Googie Coffee Shops Bicycle Ride Series, riding the 11 miles from the Village Green to visit the Astro Family Restaurant at 2300 Fletcher Drive in Silver Lake. 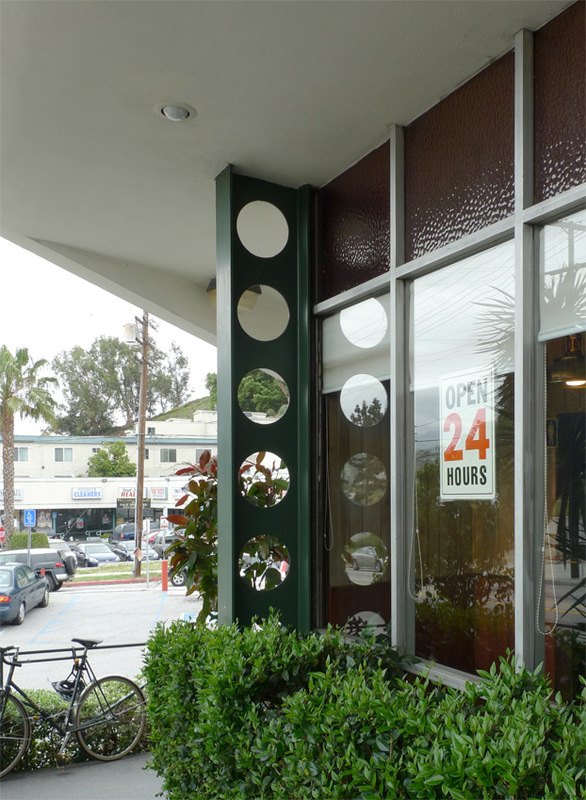 This coffee shop, formerly known as “Donly’s” and “Conrad’s”, was designed in 1958 by architects Armét and Davis. It has been remodeled and blanded up a bit, but still possesses some charms. The dominant design motif here is that of the folded roof plate, in this case folded down at each end to a sharp point as if lightly balanced thereby. The appearance of the building suggests a structural concept about folded plates –that the folded-down triangles create structural rigidity – that may or may not be a true reflection of how the building is constructed. This folded-plate parti recalls that used in a number of mid-century bank buildings, such as the American Investment Co. of Illinois designed by W.A. Sarmiento for the prolific Bank Building & Equipment Corporation of America. 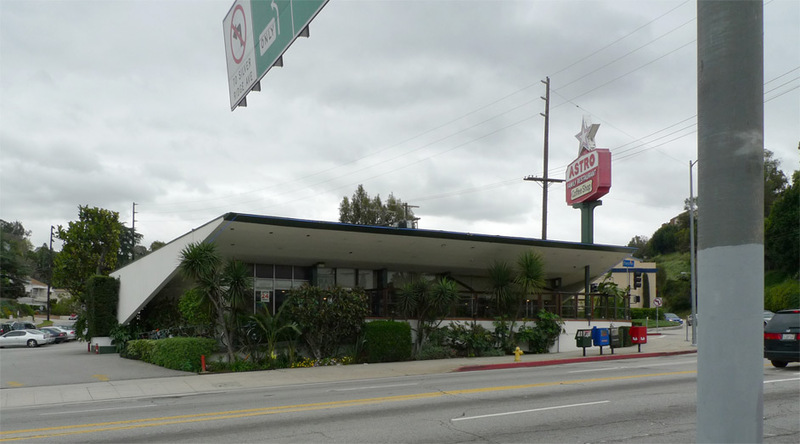 The eaves at the side are cantilevered out, honed to a razor point, and infilled with a lightweight glazed storefront wall, creating a characteristically Googie dining-room space. The lean-to character of this space is an essential component of Armét and Davis’s coffee shops. The roof tilts up toward the street, creating a sheltered and intimate space within that yet maintains its connection to the activity of the street through the lightness of the storefront. Even if you stripped out all the wild detailing and ornament, this lean-to character would still deliver its effect. The interior layout follows the same classical linear model as Pann’s, with banquettes along the window, and stools cantilevered from a terrazzo plinth facing the open kitchen. 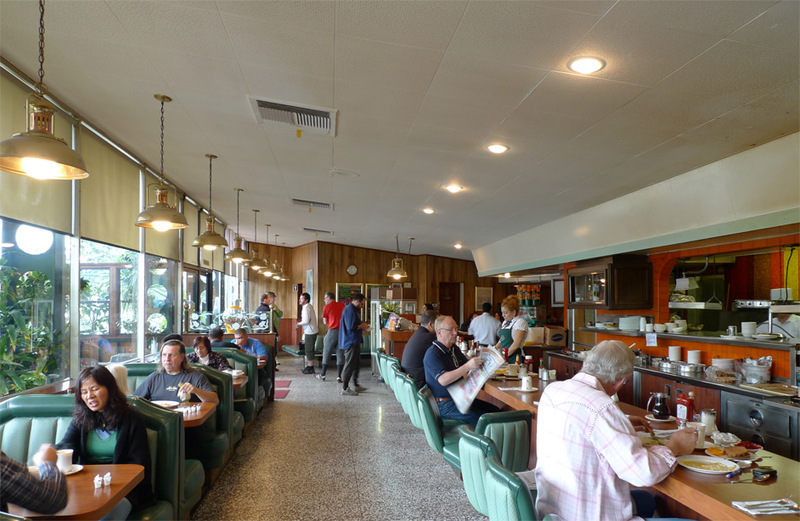 Note that the customers do not look much like Hipsters, despite the Silver Lake location.